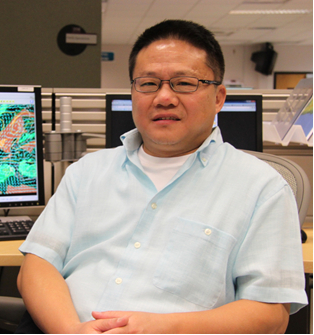 Q & A with NHC - Kevin Yeh, Ph.D. The word "scientific" in your title must mean you really enjoy science. I have always been interested in the physical sciences, and meteorology is one of them. At a young age, I did well in school in all areas of science, especially in physics and mathematics. I must have been 10 years old when I decided I wanted to do scientific research. Was there something that triggered your interest in hurricanes? I grew up in Taiwan, and typhoons were always fascinating to me. Every year, there would be so much damage to property and (sadly) some lives taken away. They certainly got my attention and made a real impression on me as a child. Was all of your education in Taiwan? My college work is in Taiwan, at the National Taiwan University; and my graduate work is in the United States, at Purdue University. I tried to get myself multidisciplined in my interests, so I got a Bachelor degree in Physics and a Masters in Mathematics. After that, I decided to get a Ph.D. in Meteorology. That gave me a good foundation to do some really interesting research. Atmospheric science is one of the areas that require a lot of work to improve the accuracy. We all know how difficult that is. I felt that, eventually, the computer modeling is the way to go. We want to have precise calculations of all of the evolutions in the atmosphere. Is that an attainable goal? It's very complicated and so far, obviously, it is still not good enough. But it is an area that can be explored. So, my motivation for coming to work here at NHC is that I get to work on this project and see how the real forecasts are made. I can understand the gap between the operations and research, and I am trying to figure out what's needed to significantly improve the computer model forecast. You are here as part of the Hurricane Forecast Improvement Project (HFIP). The project is going well. It has really helped that there is a very nice chemistry for me to work here. I was not sure of the operational aspect here, but I was able to get familiar with it in just a couple of months and was able to be prepared for operations very quickly. Everyone here has been very helpful. Reducing the errors in intensity forecasting was a main goal of HFIP. And that's the area in which I am most interested. I had been working on dynamical hurricane models four years before I arrived at NHC, along with 10 years of extensive work on other weather and climate models. I found that the hurricane intensity forecasts from these models were not very consistent. But I found the NHC official forecast was substantially better than the model output. So I want to understand how they do it. I've seen all of these intensity models, especially the SHIPS model used here - that one is a statistical model. In the future, I want to improve the statistical model and take the knowledge used in the statistical model and put it into a dynamical model. When you leave the building at the end of the day, how do you turn it off? I just change my clothes, and go for a walk. I am a big Miami Heat fan, so I get to a few of the ball games. What is the easiest part of your job? My arrival and transition here has been very smooth. There were no surprises. I am most interested in improving hurricane intensity forecast models, both statistically and dynamically. I would like to work on statistical models for at least a few years, as they are currently offering the best guidance for the operation. Then I would like to incorporate the knowledge used in the statistical models into dynamical models to see if it can further improve hurricane intensity forecast.